Did you know that Fremont, CA has the largest concentration of Afghan people in the US? Heck, I didn't know that, especially since I live in Vancouver, B.C.! 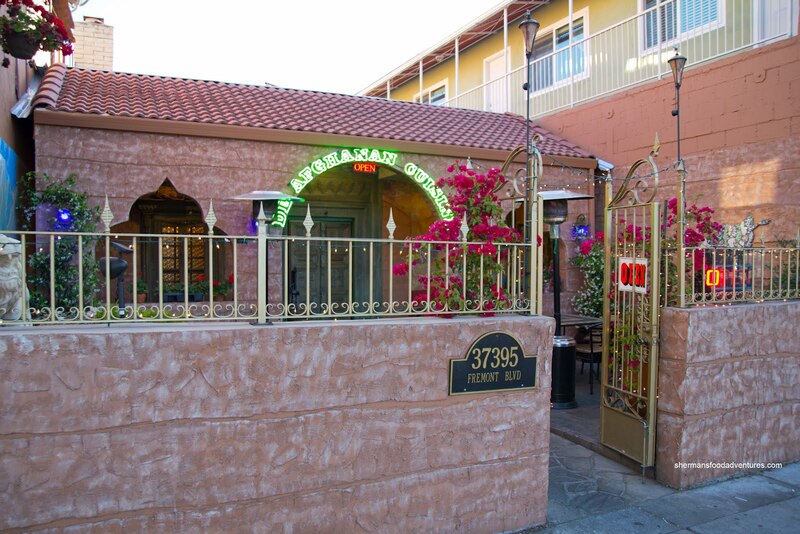 We only have like 3 Afghan restaurants! As such, we took up my uncle's suggestion that we eat at one of the many authentic Afghan restaurants in town. His preference was De Afghanan, rather than the more well-known Salang Pass across the street. We actually ended up driving past the place because of its inset front entrance. I guessed using the GPS would've been a better idea? Geez, I visit Fremont every 2 years, I really thought I could do this freestyle. I guess it is a guy thing... Anyways, we were a fairly large group and the staff rearranged some tables to accommodate us. They were friendly and helpful throughout dinner. 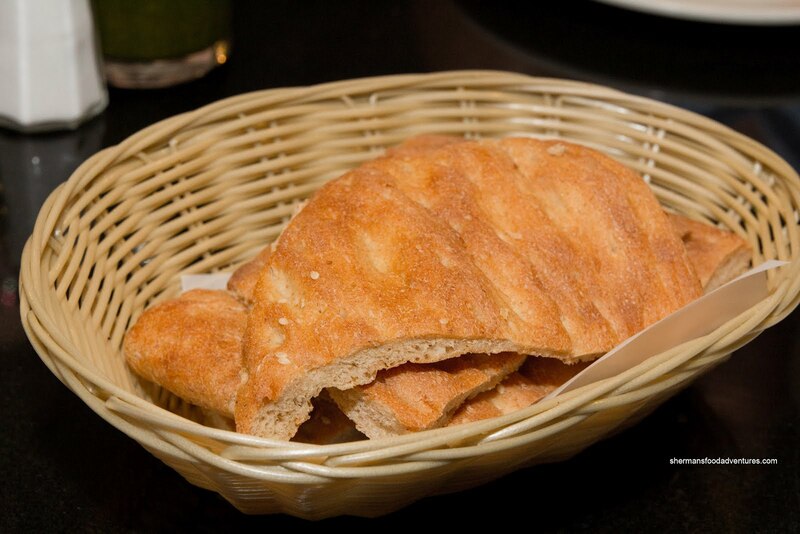 As for the food, we were presented with some Afghan Bread to start. I'm sorry to say that the bread was terrible. 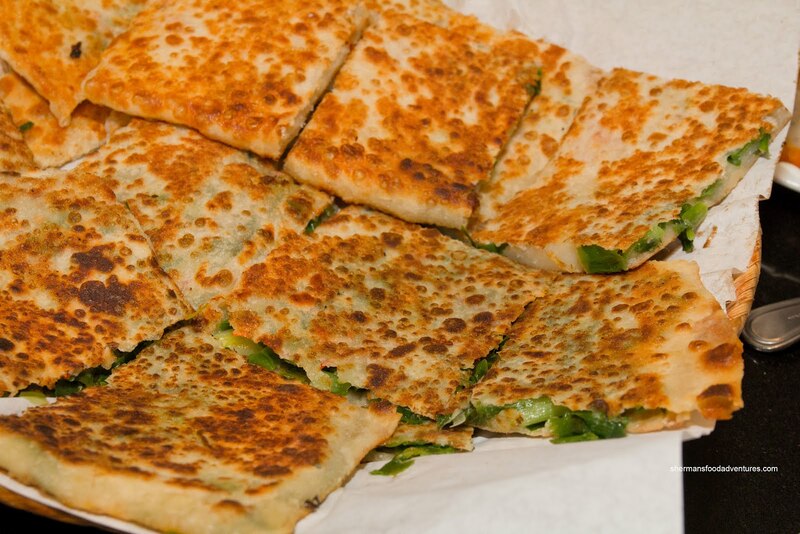 It had the texture of day-old pita bread that had been sitting out on the counter. It was really chewy and some parts were practically impossible to break down. I've had much better Afghan bread before. 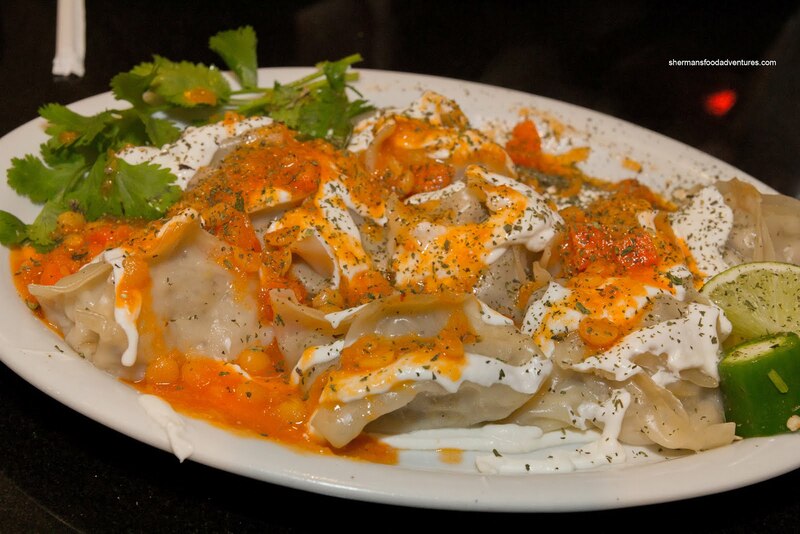 Fortunately, it got better when we were presented with the Mantu. 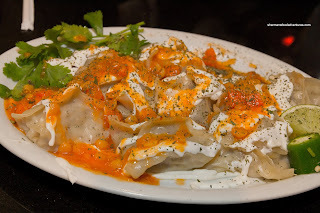 These fluffy dumplings were filled with a tasty filling which featured moist ground beef and sweet onions. The sprinkling of corn niblets provided a nice sweetness and crunch. The dumpling skin was thin and super easy to eat. There was just enough yogurt and sauce for flavour and moisture. 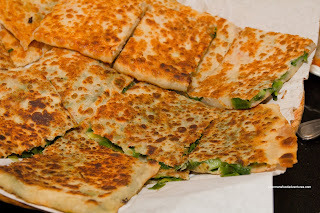 Next up, we had a really large plate of Bolani, which are leek & potato pastries baked on a flat pan and served with yogurt and cilantro chutney. These were pretty good with a nice golden crispy exterior yielding to a soft center. There was an underlying spiciness to it and when combined with the soothing yogurt chutney, the flavours were harmonious. Moving along, the Bodinjon arrived. What amounted to essentially roasted slices of eggplant topped with garlic yogurt and mint, it was enjoyable to eat. 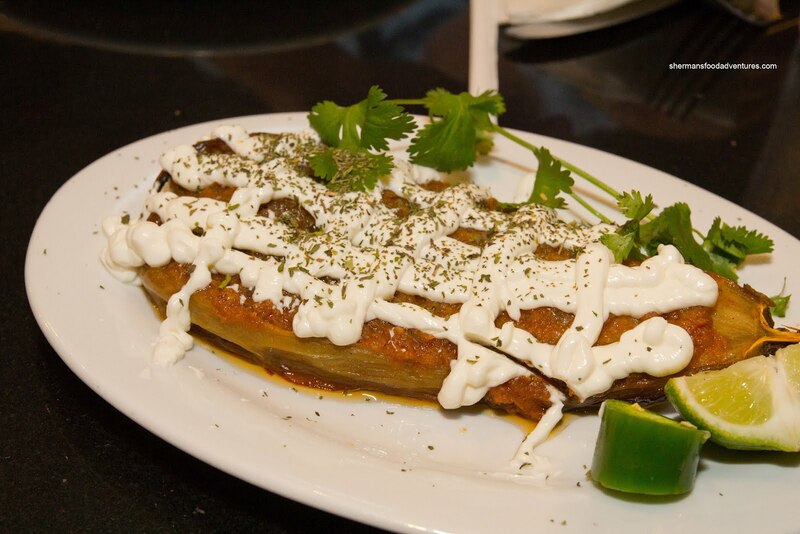 As simple as it appeared, the eggplant was moist without being mushy while the flavours were mild and pleasant. A squeeze of lime seemed to liven things up a bit. Onto the mains, I attacked the Qabili Pallow first. Hey, I just can't resist lamb shank! The lamb shank was pretty large and beautifully prepared, the meat was super moist and tender while not being all that gamy. 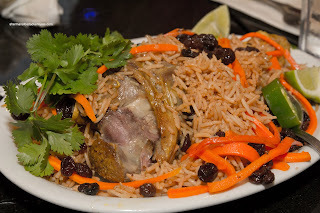 It was buried beneath basmati rice, julienned carrots and raisins. I've had this dish several times before and this one is the best by far. In addition to the beautiful lamb shank, the rice was flavourful with the desirable texture that rode a balance between soft and chewy. The raisins really brought everything together as they were plump and sweet. Continuing on the lamb theme, we had the Lamb Kabob which featured grilled lamb chunks, basmati rice and a small salad. I liked how there was a fair amount of charring on the outside which added both flavour and texture in the form of smokiness and crunch. The lamb itself was moist and tender with very little gaminess. 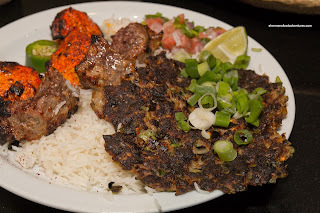 In addition to this, we had ordered beef and chicken kabobs as well, but to keep it simple, I'm only posting a picture of the Combination Kabob which included both of those as well as Chapli (beef patty mixed with green onion, eggs and spices). 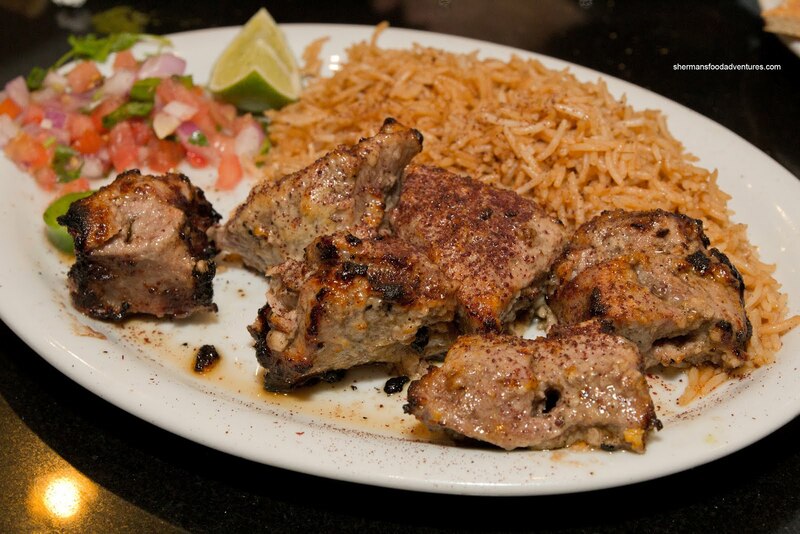 The beef kabobs were on par with the lamb being moist and tender. Once again, the charring on the outside helped heighten the flavours. As for the chicken, it was pretty moist for breast meat and as evidenced in the picture, the spots of charring were welcomed. The chapli was rather dry and flat. I realized that it should be flat, but this version was far too thin and it became more of a meat crisp than anything. Nearing the end of the meal, we had plenty of leftovers. The food, in general, was prepared nicely (excluding the bread and the chapli). The experience was further enhanced by the friendly and efficient staff. 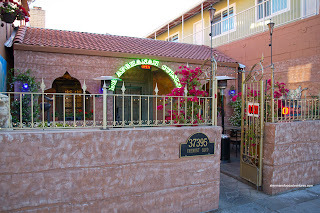 If De Afghanan is any indication, I guess the next time we're in Fremont, we need to hit up the other Afghan restaurants. @Tony You're right, most of my experiences in the States have been good servicewise. It is no secret that service in Vancouver on the whole is crappy. Probably explains why we don't even have a Michelin star restaurant in town. I guess it has something to do with the large amount of Asian-run establishments as well. On average, the service at these places are not good.